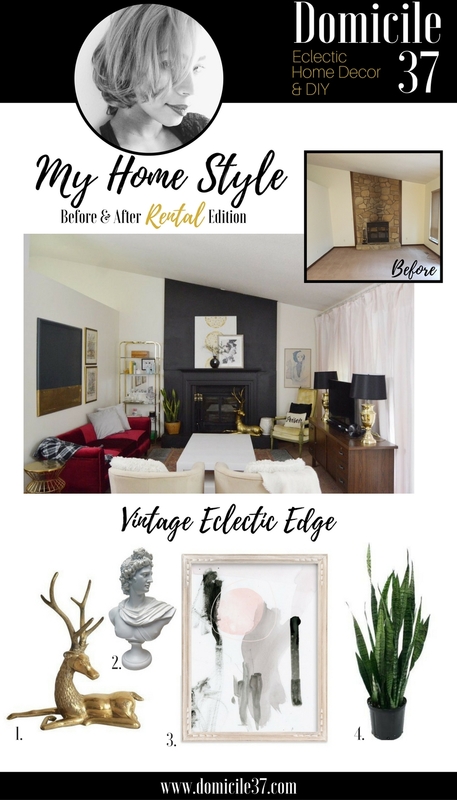 Before I start rolling in the details on how to achieve my Vintage Eclectic Edgy home style, I wanted to thank Stephanie over at Casa Watkins Living for hosting such an amazing blog hop. If you have been following along this hop you probably have seen a variation of styles just in this line up. For those of you coming from The Happy Housie, welcome! 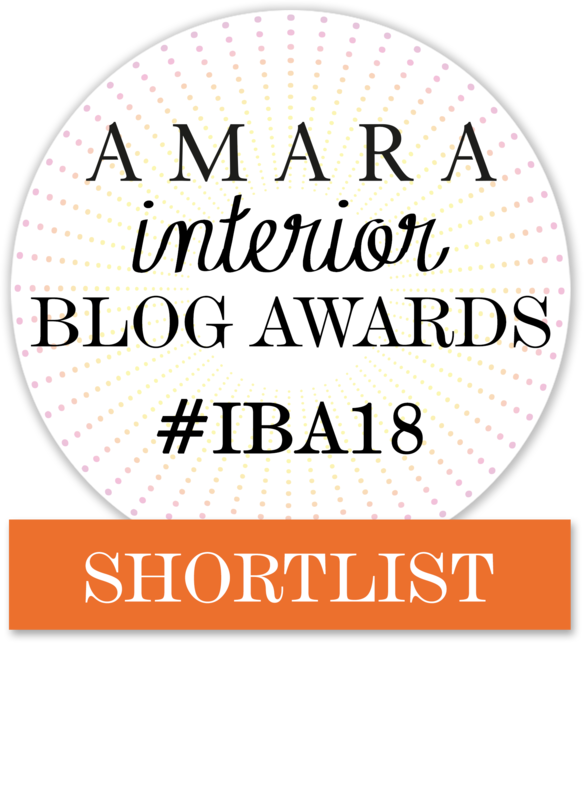 Everyone participating is so unique when it comes to their personal style and gifted interior stylist, so make sure you check out the participants that shared earlier in the week and those that will share tomorrow as well. Trust me, they will inspire you!! 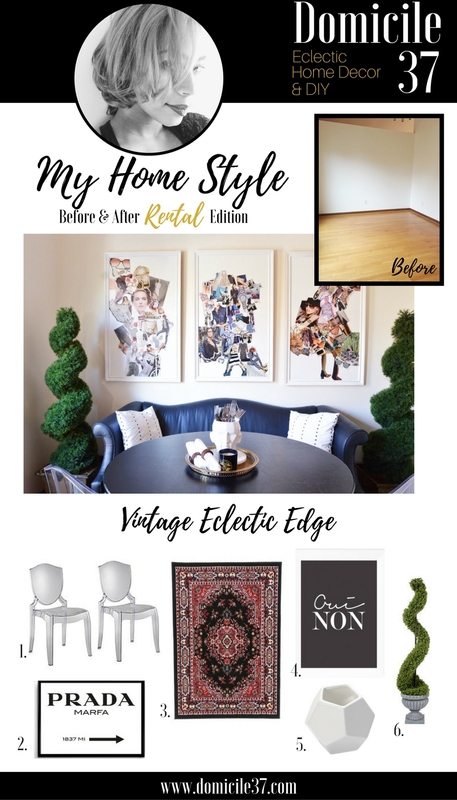 If I had to choose three words to describe my style, it would be: VINTAGE…ECLECTIC…EDGE (edgy). I love vintage decor. In fact, most of my home decor is thrifted. I like some stuff that I see in stores, but nothing beats the hunt for treasure, if you know what I mean. The history behind an object is always fascinating to me, as well. The word Eclectic comes into play, because I like everything. I like to mix and match styles and make my brain hurt from thinking. Haha!!! No, just kidding. I just do not like things that look like they should obviously be together. 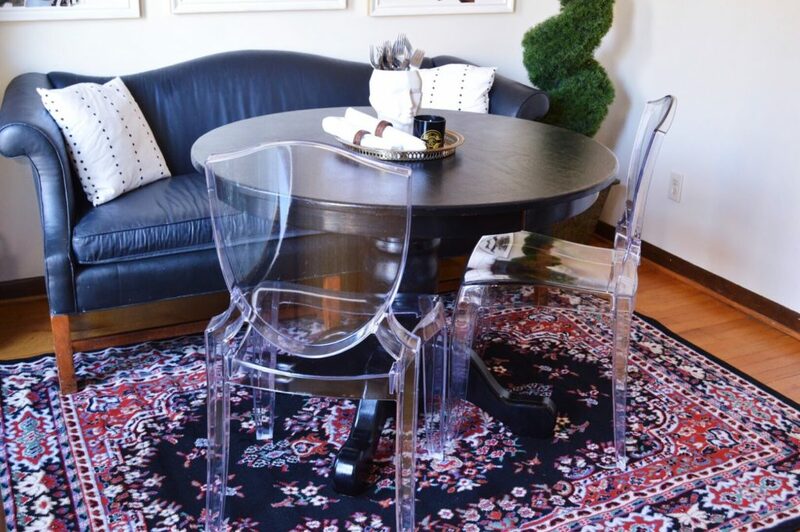 I have a true admiration for Eclectic decor and those designers who can pull off this look. I would like to consider myself edgy stylistically. 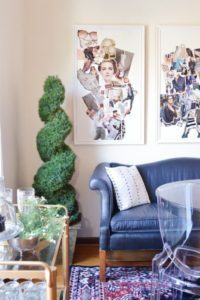 I am also a bit moody, but that has been proved challenging and hard for me to achieves since I was living in a rental and could not achieve the overall look my heart desired. 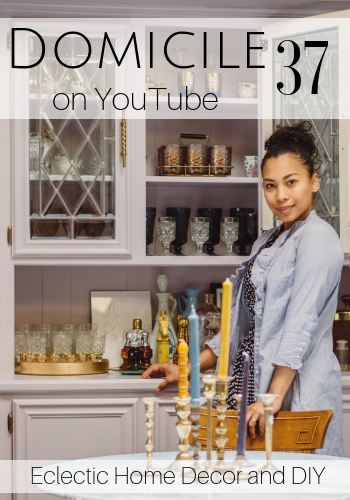 I am sharing two of my favorite spaces (dining room and family/eating area) from my past rental that showcases my style perfectly…Enjoy! 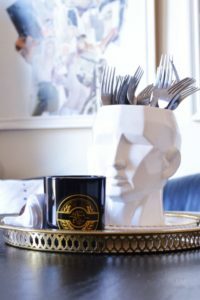 *Please note, the Urban Trends Ceramic Face Vase is no longer sold. Also, I DIYed my own Signage and Art in this room, the items listed above are places you can buy similar prints from. 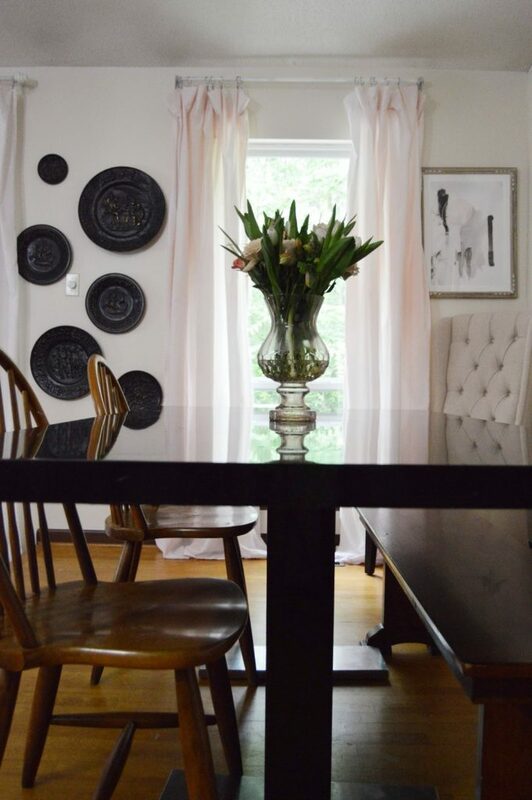 Here is a double header or a two for one for you, my most recent One Room Challenge makeover. I made-over my rental family room and eating area. Literally 6 weeks of labor to find out the day of the reveal that (at that time) there would be a 95% possibility that we would be moving. Oh-well, at least I got to enjoy lounging in a pretty room. I don’t recall ever writing a “we moved” post, but hey, we moved! 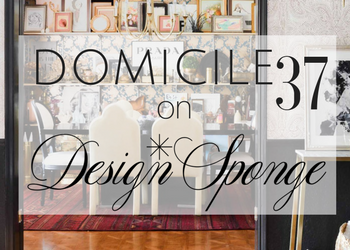 Yup, if you have been following Domicile 37, you may have realized that we moved twice in one year. My husband was offered an incredible job opportunity that he could not pass up. So we moved from the East Coast to South…Texas of all places—I say that with sarcasm, because I was raised in Texas and this moved came as a shock to me and I am still kind of adjusting. 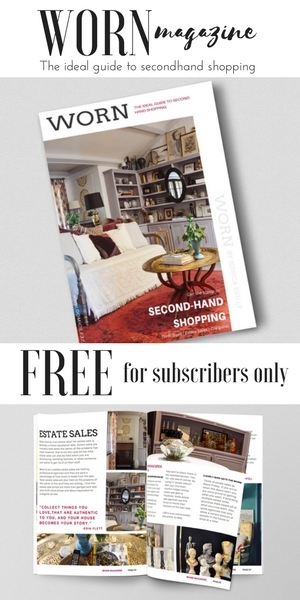 Also, if you are subscribed to my site, you should be receiving my insiders only newsletters. 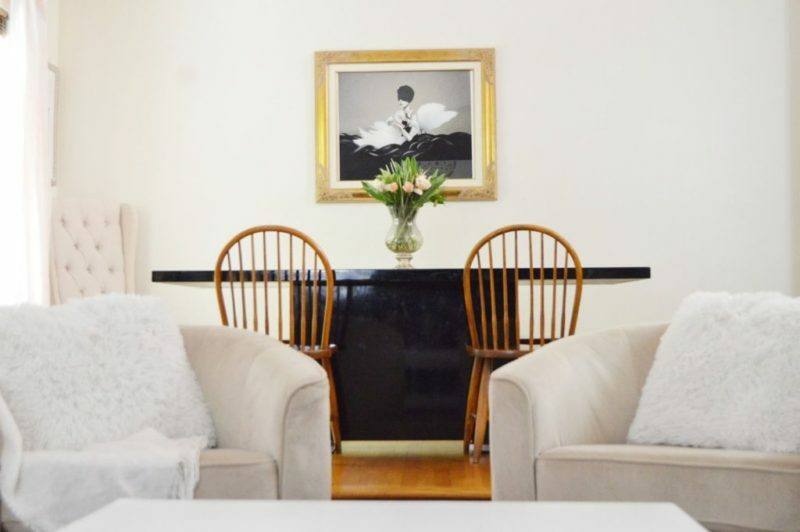 I have switched the way I write my newsletters so they are more personal and I know so far I have shared my thoughts about moving, and a home tour of my new casa. I plan to share more…Meanwhile, I have been slaving away painting, unpacking, and trying to get settle so the ball has been rolling very slowly for me, but I am hoping to have a house update for you in the near future. 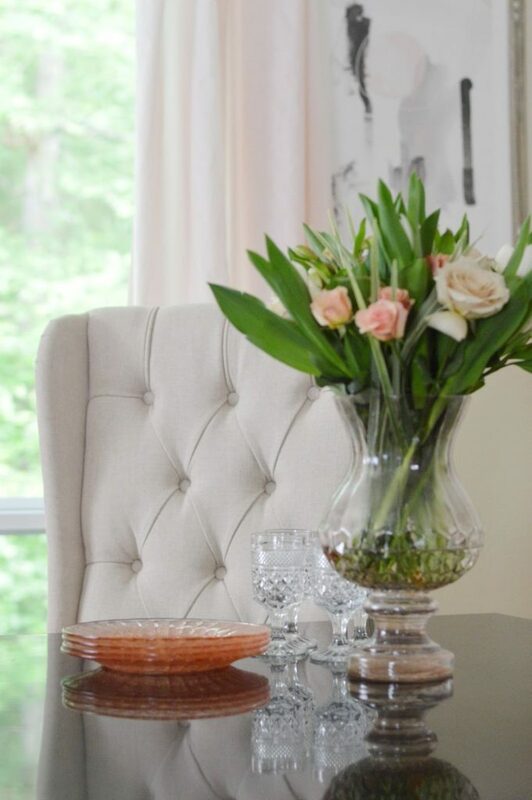 In the meanwhile, please stop by Willow Street Interiors, she will be ending todays My Home Style Challenge. 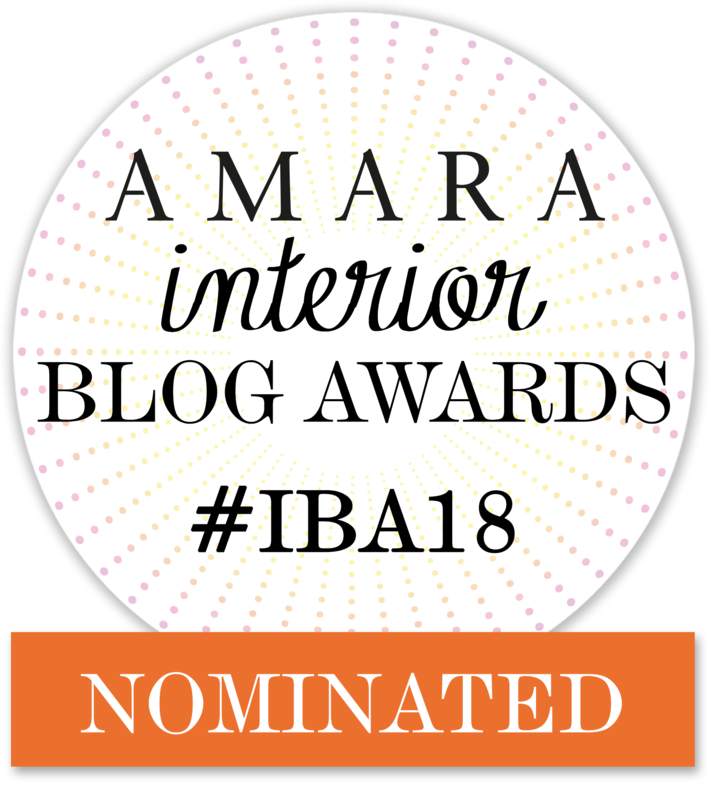 For more inspirational interior styling, please visit the ladies below…That is where I will be! Your fireplace before and after still makes me happy every time I see it! And I love that you used the word “edge” – creative and perfect! Thank you so much! I have the hardest time describing my style but that word always comes to mind. i loved what you did with that rental and i can’t wait to see what you do in your new home! you have such fab style! Thanks Cass! I cannot wait to see my vision for our new home come alive and I am so happy with all I did in our previous home. Awww, Thank you so much! You literally made my day! I adore your style Jess! You do it so well! 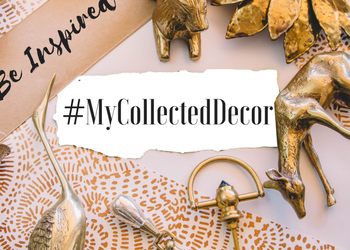 I’ve become a bit more eclectic in my personal style as well, and it’s starting to show in spaces around my home. I think bloggers such as yourself, Steph, and a few others have really opened my eyes up to the fact that it’s okay to stand out a bit. Glad to be a part of this tour with you! Thank you! 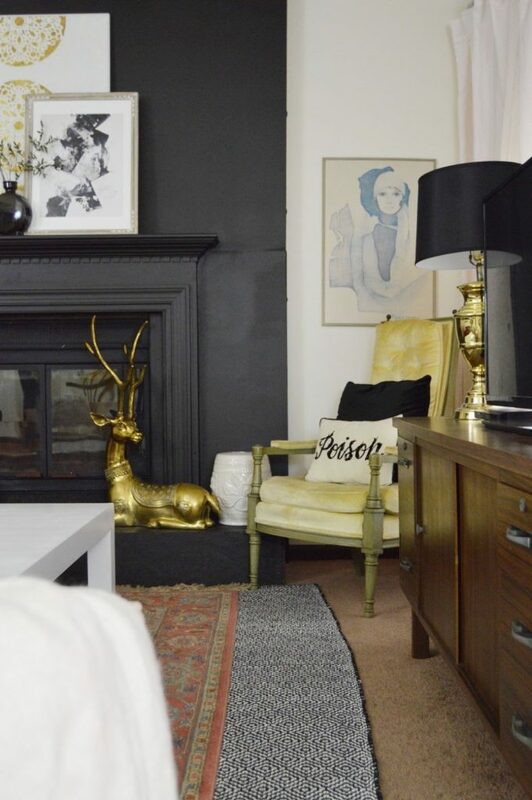 I can see you adding some neutral boho into your space and calling it boho-chic. Wow! What a transformation. It looks fabulous. I’m so envious of your photography skills too! It’s just beautiful, Jess! So creative and amazing. Love it! Thank you Amy! You are too kind! Your rental looks great! 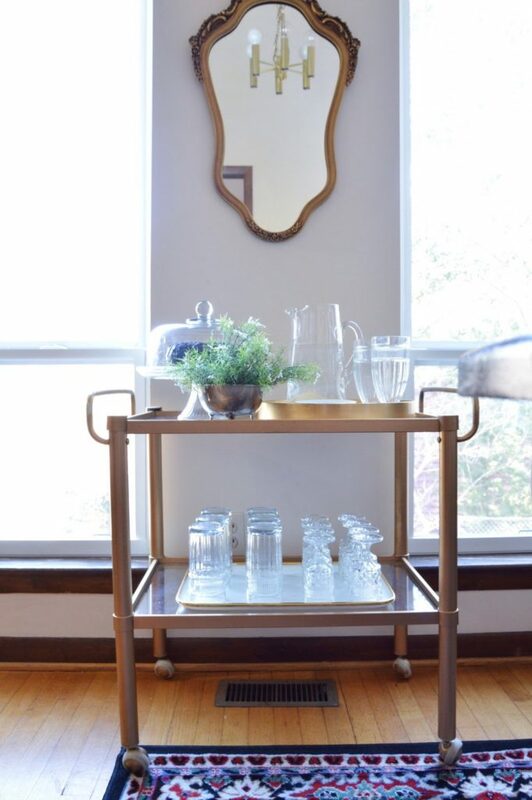 And your new home will be so much easier to decorate since you’ve really honed in on your style! I am hoping my vision exceeds my expectation, but I am just so happy to have something to call my own. Thank you Carrie! 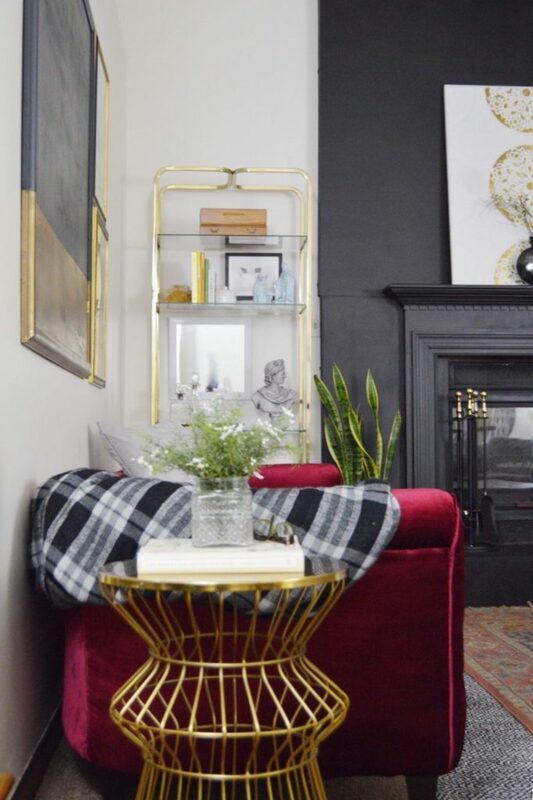 I love so much about this space; the black as a focal point, the red couch, the DIYed wall collage art, and all the edgy touches that make the space feel like home. 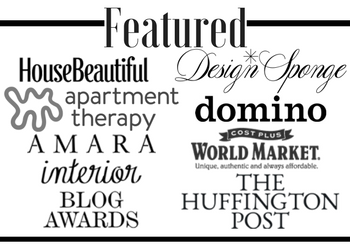 You have such a flair for design Jess! 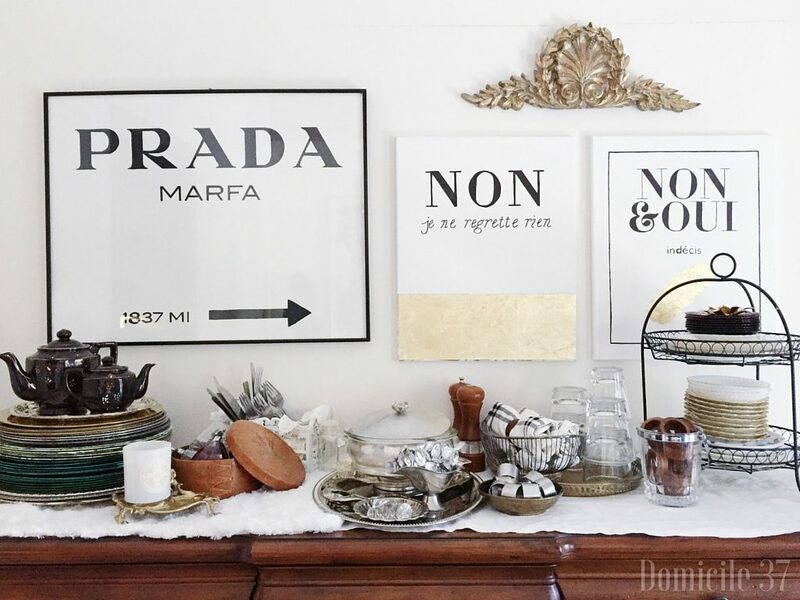 Love the drama, edginess, and vintage details in your spaces. Can’t wait to see your new home!! I almost bought that exact rug yesterday! (laughing) I bought the version with dark blue on the edge instead of the black. Too funny 🙂 Love these rooms and CANNOT wait to see what you do with your new house! That is so funny! I remember sitting on this rug for a whole month prior to purchasing it. I am so happy I did. Although it is a cheap rug, it is one of my favorites! You will love yours! Your family room was so gorgeous…it would be hard to leave that behind, but I know you’ll keep doing great things in a new space! Thank you Gretchen! You are too kind! I adore your edgy style! Jess this is so pretty! Your edgy style is so stylish and definitely a statement. Love those key pieces !